Wandering Jews will not have to travel for forty days or through the desert to celebrate Passover with Sim Shalom's Online Synagogue April 23, second night holiday celebration. We are honoring our ancestors with protecting our water and rivers, after all it's the Nile that saved baby Moses." Wandering Jews will not have to travel for forty days or through the desert to celebrate Passover with Sim Shalom's Online Synagogue April 23, second night holiday celebration. 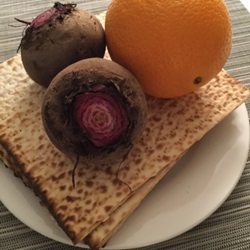 When asked the four questions, what makes this night different then all others, the international congregation might be tempted to add celebrating online and replacing the shank-bone with a beet on the Seder plate. This global dinner party, which commemorates Moses and the exodus of the Jewish people from slavery in ancient Egypt, focuses on today's community and Jewish responsibility which includes retelling the story and protecting our natural resources. Festive freedom songs including Dayenu will be sung, and readings from the Haggadah, the Jewish text that tells the story of liberation, will be read, but the symbolic Seder plate offerings that will be passed virtually around the world will substitute the sacrificial lamb with roasted beets. Rabbi and Cantor Steven Blane, Sim Shalom's founder, will lead the festivities with congregants participating live via the chat feature. He expressed the joy of observing a meatless holiday, "We are honoring our ancestors with protecting our water and rivers, after all it's the Nile that saved baby Moses." On Friday April 22, Rabbi Blane will be singing Passover songs at Knickerbockers' Cafe in Greenwich Village, NYC. Congregants can join him live in New York or meet him Saturday night online after enjoying a first night seder in their home communities. The message of both nights foster Jewish environmental responsibility, reducing meat helps to save water and meeting online reduces everyone's carbon footprint. But congregants do not have to be vegetarian or vegan as the main course will be uplifting Passover music for all to enjoy. For both occasions two wine cups will be set, one for Elijah and one for Miriam as cups of inclusion to welcome all into Sim Shalom's online home. Sim Shalom is a proud partner of the Meatless Monday Campaign, which promotes eliminating meat one day a week to protect one's health and the health of the planet. For more information click here. Rabbi Blane is also the Founder and Dean of the Jewish Spiritual Leader's Institute, http://www.jsli.net, a rabbinical school for professionals.